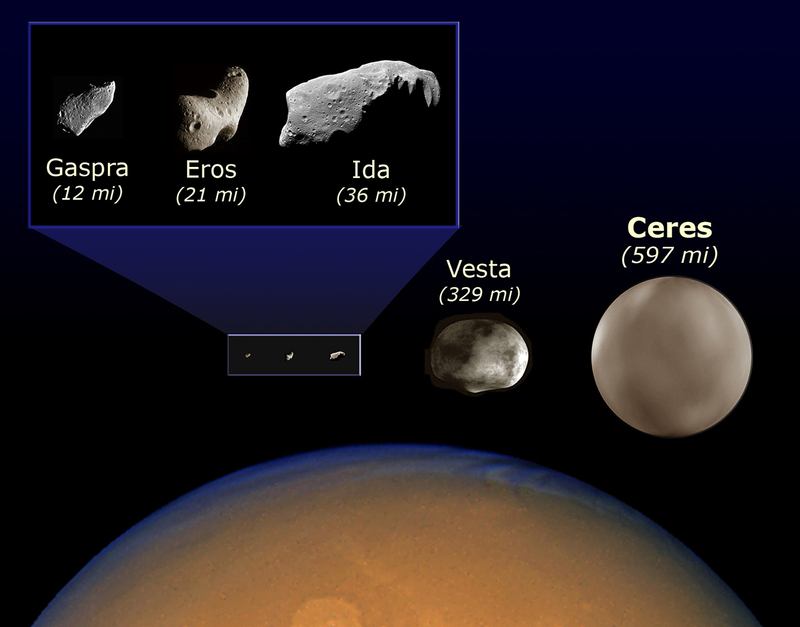 Today's topic: Asteroids! No, not the video game, not the movies, but real asteroids. Howdy, pardner! Welcome to the wild world of asteroid belting! We'll be mining those big chunks of rock and making money hand over fist in no time! I'll bet you thought our next stop after the red planet would be the big planet, Jupiter, but you're wrong, buddy boy. Our next step away from the Sun is to the asteroid belt, where valuable minerals are just sitting there, waiting for us to grab them and use them. The popular picture of the asteroid belt is that it's a huge collection of rocks just floating around, waiting to smash a passing spacecraft. This image comes from the movies, most notably The Empire Strikes Back , where the Millennium Falcon has to dodge through these crazily hurting masses and TIE fighters get smashed up for not being better pilots. The reality is much more pedestrian. Much more like the asteroid encounter scene in 2001: A Space Odyssey . Sure, there's a lot of rocks, and sure, they do collide with each other, but that's over the course of millions of years, not on a minute-by-minute basis. And what's more, we've sent about a dozen spacecraft through it and, except when we intentionally crashed on one, never came within a million miles of one. One other persistent myth is that there's enough mass out there to make a good-sized planet, which has been named Phaeton. The reality is that all the asteroids in the belt wouldn't add up to something the size of Pluto, which isn't even considered a planet any more. But that doesn't mean the asteroids aren't valuable. As tiny planet-like objects, some of them will have a lot of useful minerals, like iron and titanium. Some will have oxygen or water. Most will be almost worthless piles of dirt and dust, but there's a good chance of finding a few that will pay for the trouble of going up there. Ceres, the largest of the asteroids, is now considered to be a dwarf planet, just like Pluto now is. There are quite a few of these dwarf planets in our solar system, and Ceres isn't the largest, but it's the closest to us, and it's likely to be the most important object in that area. Because it's so big, it's very likely to have a lot of good minerals to recover. As a dwarf planet, Ceres is so large that it has enough gravity to be roughly spherical in shape, but not enough to clear out its orbit of most other debris, and so form Phaeton. One more thing about asteroids: there are a lot more of them than the ones in the asteroid belt between Mars and Jupiter. They're all over the Solar system, and many of them orbit near Earth. In fact, many of them cross Earth's orbit every year, and one of them might crash into us in a few years. Many are discovered right after passing close by - some closer than the moon is to us. Should one of these impact the Earth, it would be a very bad day, and no one would see it coming. I don't know about you, but I'd like it if someone started actively scanning the heavens for all the asteroids that could impact the Earth. Despite what some of the movies would have you believe, there is no such effort, and a bad day can happen with zero warning right now. If you think this is important, start bugging your congress-critter to do something useful instead of trying to destroy the country with health care "reform".